Now that I’m 40, I’m ready to tackle the year ahead, and the next decade. I got a ton of things to do before I turn 50, because by then I may have to have knee replacement surgery or I just can’t walk anymore. Or it’s the fact that once I do hit 50, I’ll consider myself an old fart, so I got 10 years to hold on to my youthful self and do things I’ve not done yet. For example, becoming an actual first-time home buyer. This house buying thing makes me feel like a college student about ready to graduate. The “professors” give you “homework.” You have to do research, ask for assistance, research some more, fill your brain with knowledge, type out “essays”, sign and turn in everything before the due date, and pray for a good grade in order to graduate, which is your closing day. Oh, and you have to pay up to 20% down on your “student loan” right off the bat! Packing is another story. I definitely can relate to that Woody and Buzz Lightyear meme you see all over the interwebs: Moving boxes…moving boxes everywhere!! Another example is to travel more, and further away from home. The goal I want to pursue this year is the get our passports. I’d love to make plans to head to Montreal for some hockey action, because Mike is a Canadiens fan and he would love to see one of their home games. Plus for long-term vacay planning, visiting Europe, because I gotta go now before I get too old to walk 10 miles and complain about it. I’ll have to prepare my body to fast for a month prior to a trip to Italy or Germany because the food looks so amazeballs, I will more than likely come home 30 pounds heavier!! Last example, cook/bake things I normally don’t cook/bake. I must start broadening my horizons and scope out recipes I’ve always wanted to try but never got around to them, or just forgot about them. And then there are things I have never in my entire life have made, like deviled eggs. Yes, you read that right! I’m 40 years old, and never once made deviled eggs! I think I’ll jot deviled eggs down as one recipe I’ll post for Easter. 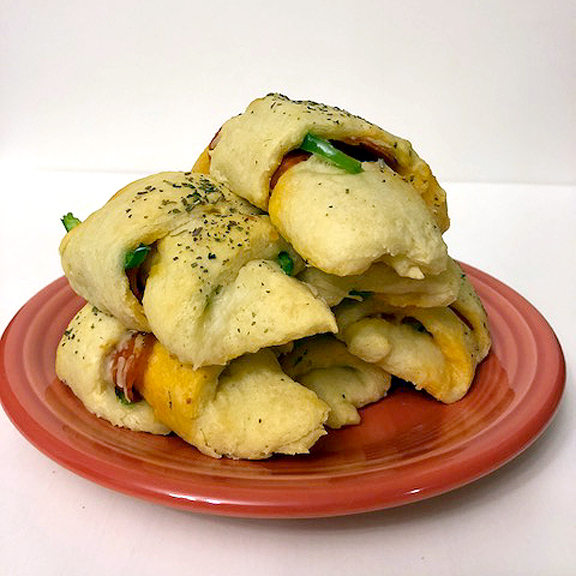 Pepperoni rolls are also something I never make, except that one time I made them after we moved into our house 15 years ago. I’m from WV and I only made these tasty state delicacies only one time?!?! I fixed that problem by making them for Alex’s 5th birthday party, and every single one of them were gone within 5 minutes! Feeling more confident, I made them again for you all! The pepperoni roll was first sold just down the road from me, in Fairmont, WV, and it made a great snack/lunch for the coal miners. They’re like little rolled up pizzas, but without the tomato sauce. 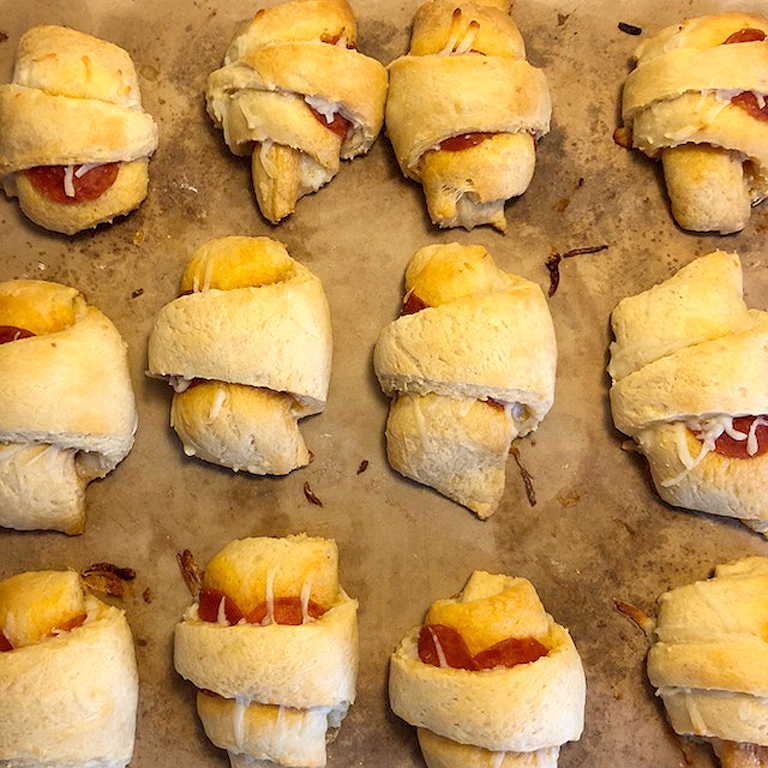 I bought a few tubes of jumbo-sized crescent rolls, sprinkled shredded mozzarella cheese on them, added 3-4 pepperoni slices, and rolled them up. When making these with the crescent rolls, follow the package directions for baking times, but I left them in the oven for a couple minutes longer until they browned just a little. If you can’t find jumbo-sized crescent rolls, the regular-sized ones work just as well. For another batch I added small green pepper slices to them for added color and sprinkled Italian seasoning on top. My brother gave me hell for doing this..LOL! I’m also currently working on the perfect dough for these, so keep watch on this space for another post once I finally get it to work out! If this is your first time making them, I highly recommend giving them a shot. The Super Bowl is coming up, and they are one of the best finger foods to have on hand for your party, or any party! Make them, and I’m sure they will go quick! • Open up the crescent roll tube and separate each triangular piece out on a lightly floured surface. 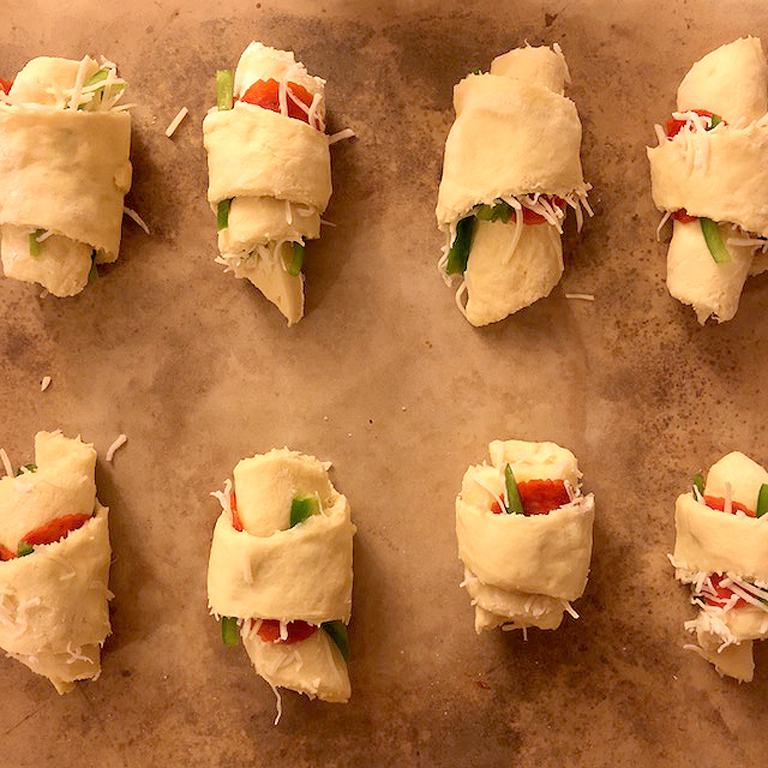 • Sprinkle the mozzarella cheese over each triangular piece, about 1/4 cup each, more or less if you choose. 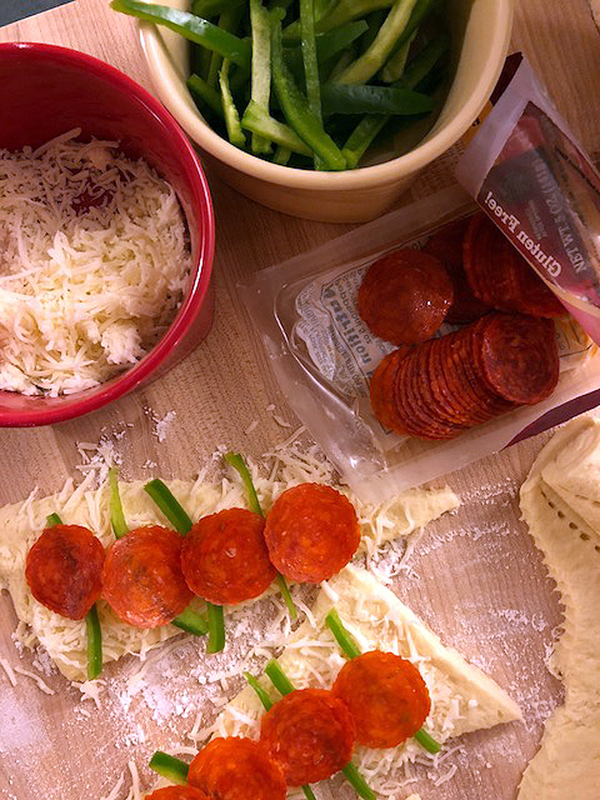 • Place 2 or 3 pepper slices over top of the cheese on each triangular dough, if desired, and then place 3 or 4 slices of pepperoni on each. 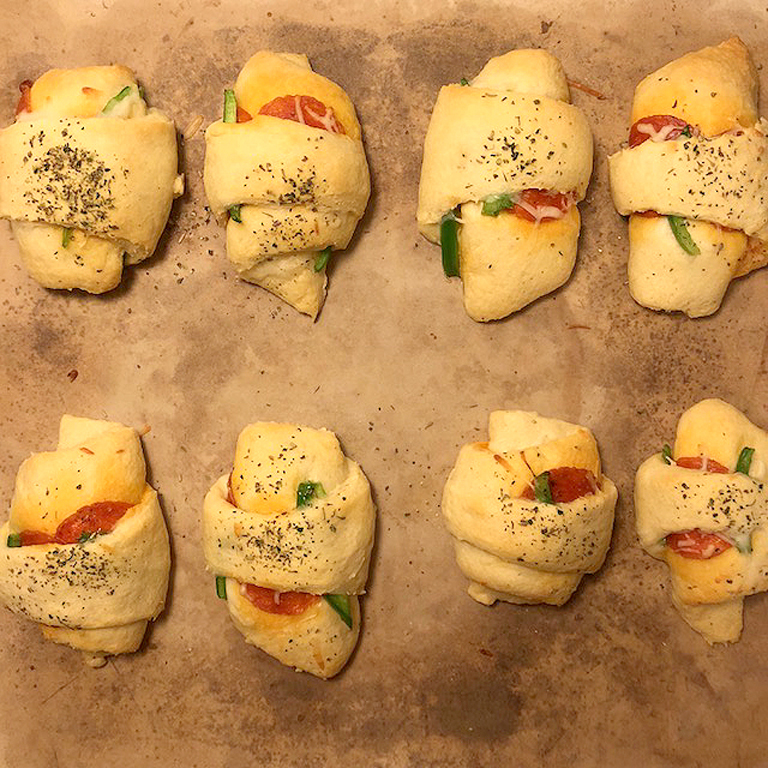 • Carefully roll up the dough and place on an ungreased baking sheet or stone. • Using a pastry brush, lightly brush the melted margarine over the top of each roll. Sprinkle a little Italian seasoning over top each roll, if desired. • Bake in the oven for 15 minutes or until the rolls are a golden brown. • Remove from oven and transfer rolls onto cooling racks to cool slightly. • Serve warm or cooled. • For storage, there is no need to refrigerate. Just place the extras in a ziplock bag or in a storage container.